How to change the PowerPoint Slide Orientation in Microsoft PowerPoint 2013? This article will explain how to change the PowerPoint Slide Orientation in Microsoft PowerPoint 2013. 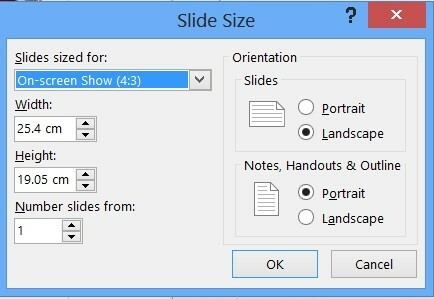 If you want to change the orientation to landscape or portrait in Microsoft PowerPoint 2013, you can do it easily from the Slide Size Dialog. Along with the orientation, one can also change the other properties like hand-outs, outlines etc. 1. 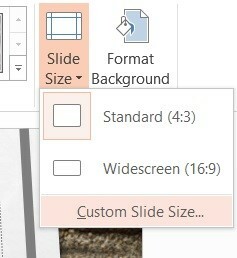 In the Microsoft PowerPoint slide, navigate to “Design” tab and select “Custom Size” from the Slide Size dropdown menu. 2. In the Slide Size Dialog screen, select the appropriate orientation – Portrait or Landscape from the slides radio button and click OK.
3. You should see your slide in the selected orientation. This can be a pretty useful feature especially if you want to modify the orientation of your PowerPoint presentations.